Most of us, at one time or other, have been given the advice “listen to your doctor.” We agree completely, but not the way you think. It is amazing how many medical doctors and PhD’s in our community are runners. We know running makes you smarter, but in this case it’s the running that comes AFTER the education. These educated individuals know that running is healthy and improves quality of life so they become runners. So when we “listen to our doctor”, we are usually running beside them, rather than being treated for an illness in their office. Some of our best running advice comes from their experience as a runner. It’s not the usual advice you would see in any running magazine. They may not even remember dispensing this advice and they certainly didn’t charge us for it, but it has certainly made a difference in our running lifes. Doctor of Chiropractic, Jay Cook, suggests that as you get older you should always put on and take off your socks standing up. This promotes balance and strength as you are forced to stand on one leg or the other. He also recommends a subtle technique that we use while running. When you are tired during a run or race, mentally think of relaxing each leg when you lift it between ground strikes. Try this; it really works to give you extra energy during a tough run. Dr. Jay is the first person that recommended cold water immersion after a long run to speed recovery. After the Saturday morning Carmel run, Jay always wanders in the ocean at Carmel Beach to promote healing his legs. Make sure you take your shoes off before doing this and don’t go too deep. Dr. Marc Lieberman, when asked how to run a fast race, always says “go out as fast as you can for the first half and then come back faster the second half.” We learned that total effort is required to run a fast race. You have to commit early and pay the consequences by feeling some pain in order to do your best. Dr. Lieberman, during training runs, is known for grumbling about how tired he is, but always seems to have enough energy to run as fast as he can in the last mile. He says it’s “the horse smells the barn” technique and it definitely makes you a tougher and better runner to try to run hard when you are tired near the end of any run. Dr. Les Waddel, also a Doctor of Chiropractic, suggests self massage for preventing injuries. We both have tight muscles and Dr. Waddel, many years ago, suggested that after a run it’s great to massage your own muscles that chronically get tight, like the calfs and hamstrings. This promotes blood flow to the area, breaks up scar tissue, and loosens up tight tissue after a run. Don’t care about what people think when they see you doing this. This self-love definitely keeps you injury free. PhD Jon Geller, is a true student of the sport and is always up to date on the most current and scientific training methods. His source? The internet – Flocast.com . Yes – take a look at Flocast for videos of elite runners and how they train. You can incorporate it into your own training. There are workouts, drills, exercises, nutrition, and a lot of other tips. You can’t run as fast as these elites but you can certainly watch them and learn. Dr. John Ellison is a medical doctor you want to run with but you definitely don’t want to see him anywhere else. He’s in the emergency room at CHOMP and is the Big Sur Marathon’s chief doctor in the medical tent. The most frequent running problem he sees is dehydration. According to Dr. Ellison make sure you hydrate correctly; not too little and not too much. 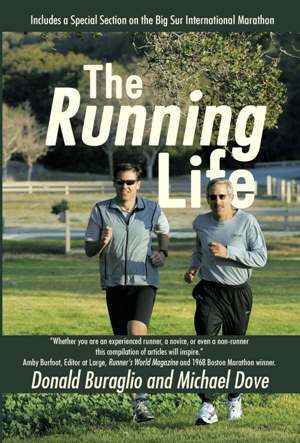 Dr. Don King, and PhD Jim Eagle, are the yin and yang of local runners. Dr. King is Mr. Downhill and Dr. Eagle is Mr. Uphill. Dr. King is known for speeding up to warp speed on every downhill while yelling, “no more lolligagging”. Dr. Eagle is known as Mr. Hill Surge and makes a point of running hard on every uphill. He leaves everyone else behind him yelling four letter words. These surging techniques, both up and down hill, really help prepare your legs for marathons and other races. PhD Doug Colton was the first to recognize that when a runner talked about something that made them angry or agitated they started running faster. We’re sure that you have all noticed that when a running friend starts talking about politics or work or a bad date they naturally speed up; sometimes when particularly agitated your running partner can even exhibit Olympic speed. Dr. Colton realized that he could use this to his advantage in races so he consciously thought of things that made him angry. Try this in your next race and we guarantee a P.R. Dr. Catherine Hambley is a clinical psychologist and a “super” mom. With four active kids she still manages to balance being a wife, mom, having a career, and running. How does she do it? Dr. Hambley says that Running provides the outlet, health, and energy to make her better at all her other activities. She gets much needed alone and reflective time as well. She prescribes running to her patients and to everyone else as well. PhD Glynn Wood has been running for 60 years. When you receive an e-mail or letter from Dr. Wood the complimentary closing he uses is “run run run”. So instead of “sincerely”, Glynn Wood, it says “run run run”, Glynn Wood. This closing has all sorts of meaning. It is Dr. Wood’s way of saying keep running, stay healthy, be your best, enjoy your life, do good things for your body, I share your passion, and love. What better way to end a letter and a Running Life column. When weight loss becomes impossible via dieting and physical exercises, phentermine, the weight loss drug may help you out. For significant details on Phentermine usage, benefits, mechanism et al, you are recommended to visit the link http://www.pill-care.com/phentermine.html but bear in mind that Phentermine is to be opted for only after getting hold of a prescription from the doctor.